- No loss of ground clearance at what is already the lowest point on the truck. - Complete protection of the vulnerable cover which can be pushed into the ring gear when hitting something in reverse. - Prevents the bottom lip from getting peeled back when dragging over rocks which will cause fluid leaks. - Allows you to maintain the factory mounts for the emergency brake cable and the rear brake line. - Doesn't require removal of the stock cover, re-sealing and re-filling. 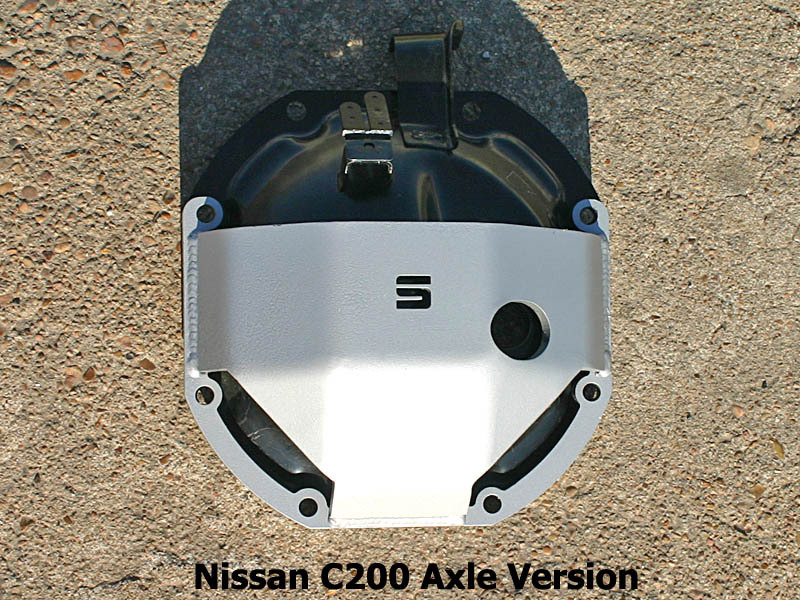 Fits 2005+ Nissan Xterra and Frontier. D44 (Dana 44) and Nissan C200 axle. Please Select D44 or C200 under Options below. 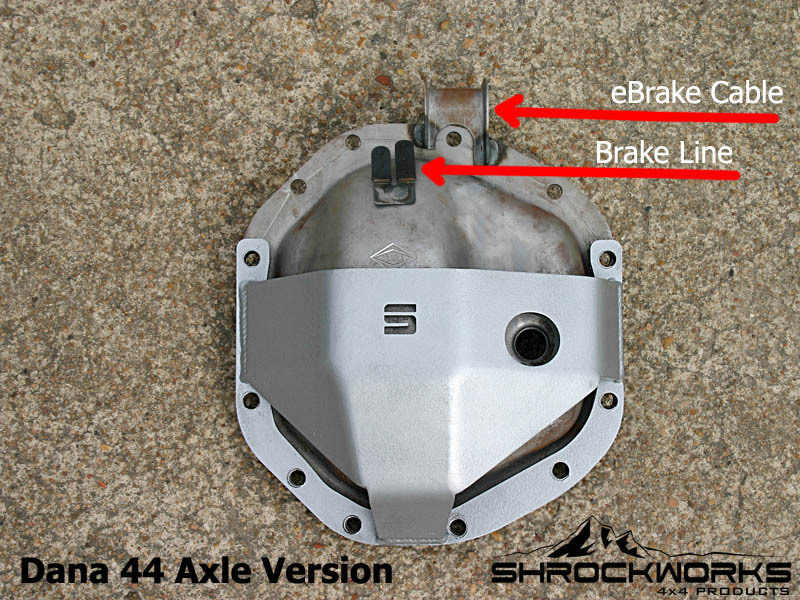 If you arent sure which axle you have, there are pictures of both versions on the right. THE BEST WAY TO BE CERTAIN which one you have is to count the number of bolts holding the factory diff cover on. As you can see in the pics to the right, there are EIGHT holes on the C200 and TWELVE on the Dana 44 (D44)...so 8-bolts = C200 and 12 bolts = D44. Here are some general guidelines, but to be sure, count the bolts. Ring and Guard are 1/4" steel New longer bolts included. Jim, Awesome product as always. I've got sliders and the full skid set. Wish you offered Solar Yellow powdercoat. After peeling back the cover twice on my 2005 Off-Road Xterra, this was a very welcome piece of armor. I gave it a real workout at Paragon Adventure Park (in PA) and I am pretty sure it prevented a third peel back. As always, great product Jim! Yet another beefy product from Shrock. No more worries about backing up on the rear diff or dropping it onto a rock. 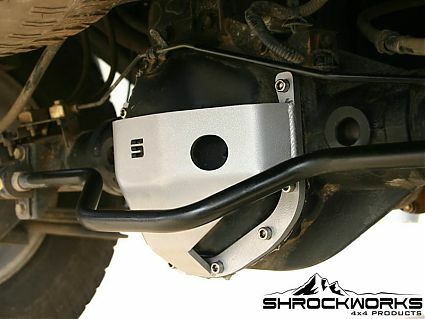 Another great product, always satisfied with Shrockworks parts. Now I have a full set of skids and can ease my mind knowing my diff isn't going to get peeled back.